Amber Bennett is a skilled VCU Employment Specialist who seamlessly assisted her Project SEARCH student, Ocie, in locating a patient transport assistant position at VCU Health System. Ocie was a student intern in the 2018-19 Project SEARCH cohort at VCU Health. Typically, Project SEARCH students complete three internships over the course of the school year. Ocie, however, only made it through the first one. Why only one? Because he did so well in that first internship in patient transport, that they wanted to hire him immediately. Striking while the iron was hot, Amber helped Ocie apply for the position and by January, Ocie was officially an employee of VCU Health Systems. Ocie works a set schedule of Monday through Friday from 8am to 12pm. He usually has one of two types of assignments. Amber refers to the first assignment as an assistantship. This is where he is partnered up with another patient transport technician and assists in transporting patients throughout the hospitals. Yes, that's hospitals, plural - Ocie's territory covers six hospitals in the VCU Health System. One of his strengths was that he quickly learned how to navigate the hospitals when starting at SEARCH, a key skill to have in patient transport. When he is not partnered up with another transporter, Ocie has another set of tasks he can do. These extra tasks were a necessary addition to keep him busy and were strategically carved out by Amber. 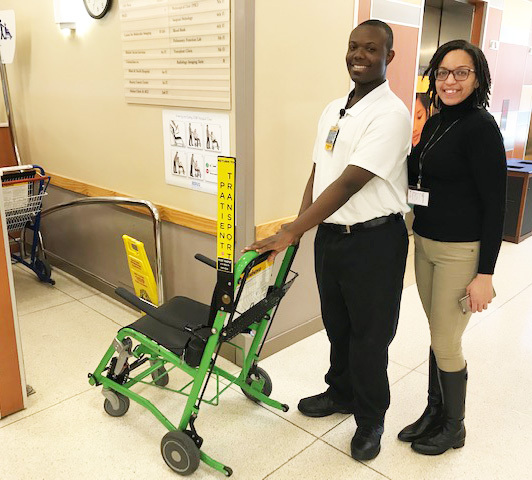 His customized tasks include keeping the wheelchair stations stocked and evenly distributed, operating the elevator for transport calls, running specimens from hospital rooms to labs, and cleaning stretchers. Jeff, the Patient Transport Dispatcher enjoys working with Ocie and reports that he is, "excellent to work with and intuitive about his assignments." 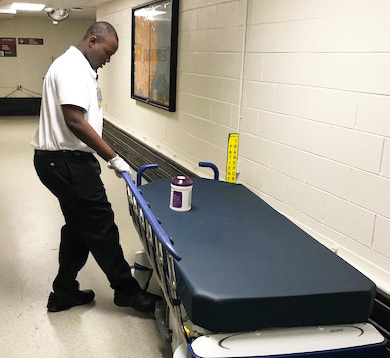 Sean Hicks, the Patient Transport Supervisor lists several qualities in Ocie that make him an outstanding employee, "Great work ethic! He asks questions when he needs to, he's on time and always willing to do what is asked of him, he's reliable, trustworthy, has great manners, and a positive attitude." From this glowing feedback, you can tell that Ocie conveys a real sense of responsibility to his coworkers. The team is tightly-knit and they support Ocie just as much as he supports them. When asked, Ocie replied that his favorite part of the job was being able to walk around. Ocie loves to stay busy but working behind a desk may not have been the preferred setting for him. Amber noticed this and other elements as to why patient transport was a great fit for Ocie. She knew that it required independence and initiative, flexibility with assignments, navigating skills, and the maturity and interpersonal skills to work with the patients. With all of these elements lining up for Ocie and the patient transport team, it is easy to see why this is such a great job match. GREAT WORK AMBER AND OCIE!! This month the RRTC is spotlighting two outstanding Employment Specialists, Kristen Hamilton and Austin Miller for their team work in developing an organizational partnership with The Vitamin Shoppe. Starting in early 2018 Kristen Hamilton was assisting her client, Ve'Shonda, with securing employment when she saw a listing on an online job board for a full-time "Health Enthusiast" position at the Vitamin Shoppe Distribution Center in Ashland. Kristen assisted Ve'Shonda in completing the application and a month later Ve'Shonda was invited in for an interview. At this point Austin Miller had taken over as Ve'Shonda's lead job coach picking up where Kristen left off. 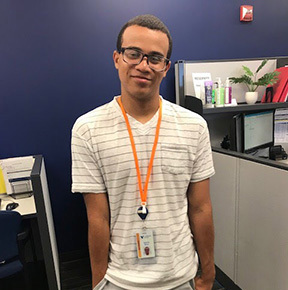 Austin accompanied Ve'Shonda through the interview and explained to the human resources staff how he would provide support for her with job site training at no cost to the employer. Ve'Shonda did great in the interview and was offered the job, starting at $13 an hour with full benefits. The Vitamin Shoppe distribution center is a massive warehouse which serves all of their retail locations on the eastern seaboard. It also fills all online orders for home deliveries for that portion of the country. They employ approximately 410 in production staff for a total of 440 including management and HR. All production positions are classified as Health Enthusiasts and management uses a process of trials to determine which role on the production floor is the best fit for each employee. Ve'Shonda started working in March and impressed everyone. 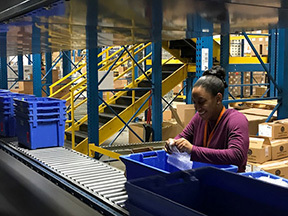 She was identified for an order picking position where she uses a scanner to look up orders and then fills a tote with the correct order by picking the items from the various shelves and then sending it down a conveyor belt. Her work performance was great and her positive and friendly personality made her new coworkers happy to work with her. A couple of months after Ve'Shonda got her job, Kristen completed a second application for a Health Enthusiast position for her Project SEARCH client, River. River was in his third internship at Project SEARCH and Kristen saw the potential he had for a good match at the Vitamin Shoppe. Since the employer had developed this successful partnership with VCU, they were happy to pull River's application amongst the masses of online applications they received. River came in for an interview and did great. Given his skill set and energetic personality, River was selected for a quality control position. His responsibility is to double check the totes that have already been filled as they come across the conveyor belt making sure they are correct and ready to be shipped out. After securing two jobs at the Vitamin Shoppe, Kristen and Austin have arranged inclusivity trainings for the distribution center staff. The first training was for the management staff. Management found this training so helpful they requested a second training with the shift leads. Mary Jo Palumbo, Human Resources Manager, reports that she relies on the VCU job coaches to help find the right fit for each individual. Mary Jo sited some other leaders in inclusive employment such as Walgreens and Sephora that she strives to model. In the months following River's new job, a third VCU client also got a job. Organizational partnerships like this one demonstrate the benefits each party contributes. Thank you Kristen and Austin for bringing VCU-RRTC and The Vitamin Shoppe together over these great jobs! 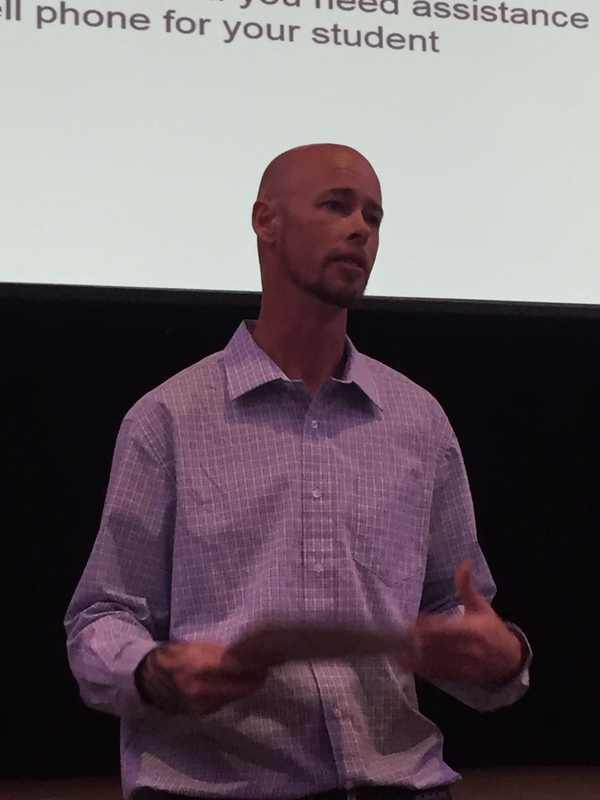 This month the VCU RRTC wants to recognize Tommy Dubois for his outstanding work in internship development and job placements at the Fort Eustis Project SEARCH site. Tommy joined the VCU RRTC team in the Fall of 2017 as the Project SEARCH program was just getting started in its first year at Fort Eustis. Tommy brought a wealth of talent and experience to the team. Being an Army veteran of 13 years, Tommy was an instant asset for his ability to translate military jargon and explain the nuances of military culture. Military culture is what the students at Fort Eustis have all been raised on; every participant in this program is either a military dependent or has a military connection in their family. Using this military theme as a base for job development Tommy successfully placed four of the graduating students in federal employment. Those who have ever applied for a federal job know, it is a very involved and lengthy application process. It can require everything from fingerprinting to physical exams to extensive background checks. Tommy had the patience and determination to go through the necessary steps with his clients and see them through to these valued placements. Some of the advantages of federal jobs worth noting for these clients are: the possibility of relocating (a common occurrence among military families), the experience which could be easily transferable to a new position, the familiar structure of a federal posi- tion, and the excellent job security in working for the federal government. Before making these great placements Tommy put in a lot of work in the internships for these students. 2017 being the initial year for the Fort Eustis Project SEARCH site, meant that all of the internships needed to be developed from scratch. Tommy played an active role in developing the 15 internships for the program. He helped establish connections with 7 different businesses in Fort Eustis to create these 15 unique opportunities. Again, let us emphasize how much work went into this: 7 different businesses, 7 different screening processes, each business a part of Fort Eustis and operating as its own independent entity. That's a lot of collaborating, worthy of applause. 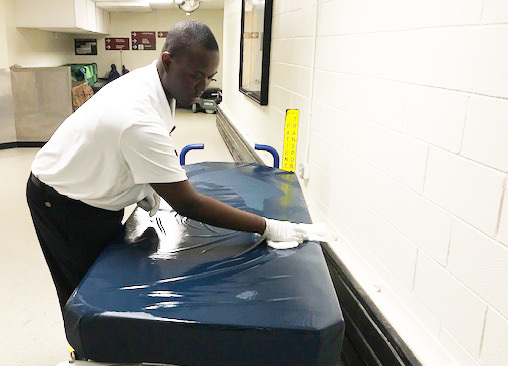 "Tommy is always willing to jump in and do what needs to be done," boasts Holly Whittenburg, the site coordinator for Fort Eustis. "He's quite skilled at working with students with autism. He doesn't settle; he pushes his clients to succeed but understands when and where supports are needed." Tommy doesn't hesitate to try fading with his clients to see how they handle it. He carries it out in a careful way and makes sure they have their supports ready before doing so. Another example of how Tommy has really brought a spark to this program was his initiative to do senior superlatives for the graduating class last Spring. Tommy assigned every student and staff member a superlative, highlighting everyone's unique and special qualities. We hear there were candy bars too. Thank you, Tommy, for your tenacious efforts in making meaningful con- nections for your clients and bringing camaraderie to the first year at Fort Eustis! 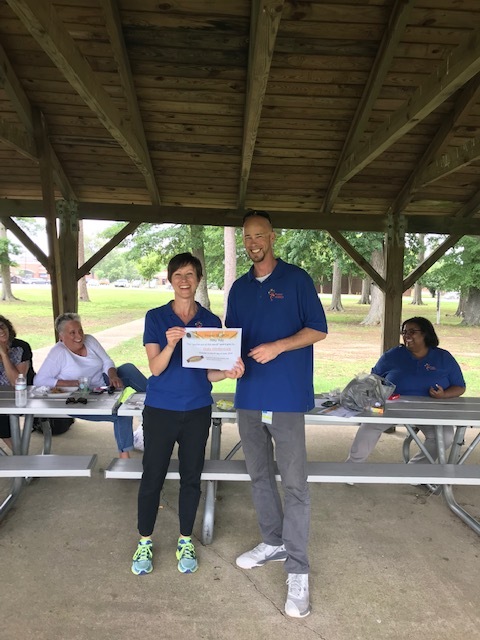 This month Business Connections wants to recognize April Lynch for the excellent work she's done to place and train her client, Sam. 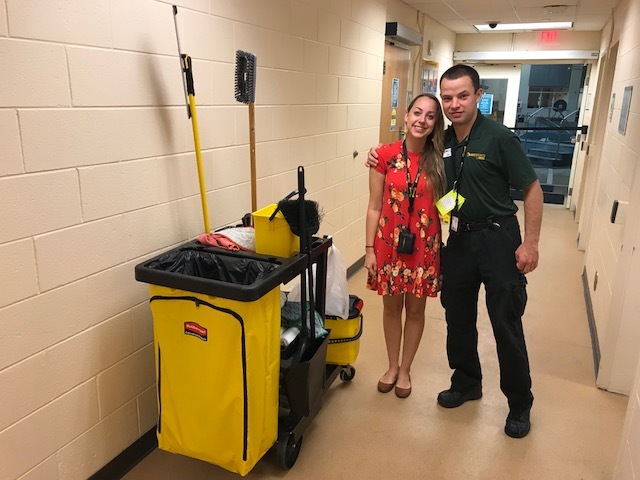 This past Spring Sam started working at the VCU Cary St. Gym as a Housekeeper and Rec Sports Assistant. After only 3 months of job site training he was ready for follow along. Sam loves sports. He loves working at the gym because he is surrounded by active people and gets to participate in the activities himself when he's not on the clock. He gets to play some of his favorite sports at the VCU gym such as kickball, volleyball, bocce ball, dodge ball, basketball and soccer. Another great perk – Sam gets to join the Rec Sports' weekend outings and go on outdoor adventures around the James River Park System. The environment at the Cary St. Gym is a big part of what fosters Sam's independence there. It's an integrated workplace where Sam works with other employees who also enjoy sports. He has a commonality with his coworkers and this gives them something to bond over. The staff recognize the good work Sam is doing and see the value in accommodating him when barriers may arise. Autonomy is a top priority to Sam. Having the support of his staff is huge, this means he doesn't have to see his job coach as often and can have more direct interface with his coworkers and supervisors. April Lynch was matched up as Sam's job coach at the beginning of April, 2018 to start job development services. By the end of the month April would have Sam placed at the Cary St. Gym in a new customized position that she crafted in collaboration with the management team there. This part-time position did not exist when April first met this employer. Not only that, but the gym had a policy of only employing undergraduate students. April saw an opportunity for Sam based on the sports theme and the gym's need for housekeeping services. 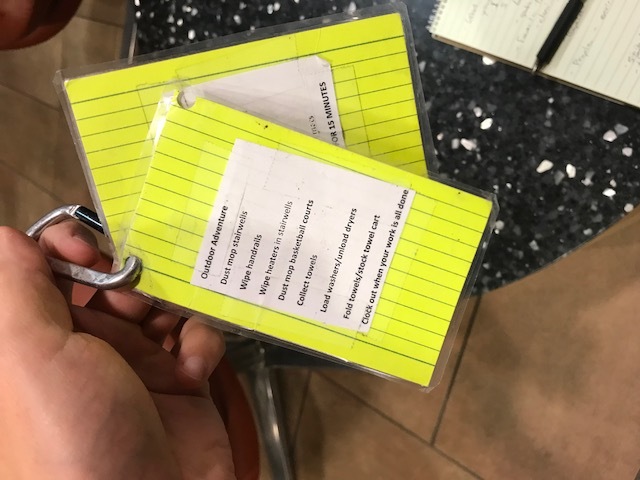 April developed a list of tasks for Sam that other employees did not have time to do or did not enjoy doing. April convinced the management team that hiring and training Sam would be beneficial to them because he would be there to stay, he would be reliable, he had the skill set for the job, and he would be motivated to work in a sports-themed environment. The management team bought the pitch and have been satisfied with Sam's work performance since his first day of work. Way to go, Sam! VCU-RRTC gives a big shout out to April for her resourcefulness and skillful ability to match her consumers with jobs that fit their interests, abilities and personality! Thank you, April!! !